To raise healthy game fish you need to provide the right environment for them to thrive. There are four key elements which are considered ideal for a productive and healthy pond that is convenient to maintain. Use these as standards when constructing a new pond, or as guidelines to make improvements to your existing pond. Check the location of your pond. It should be adjacent to a source of clean, clear water. Soil in this area should be at least 30% clay so it will hold water. The watershed should be large enough to keep the pond full – typically 10-30 times the size of the pond. If the watershed is too large, or too close to fertilized cropland or livestock pastures, consider building a ditch around part of the pond to divert some of the water. Next, look at the banks of your pond. The slope of the above-water banks should be 3:1 or 4:1 to make maintenance easier and to help prevent soil erosion. The minimum pond depth for underwater weed control is 3 feet; information on minimum depth to prevent winterkill in your area is available from local extension agents. Depth should be determined by comparing rainfall to evaporation in your area. Maximum depth is what is reasonable for your pond’s location and, of course, your budget. Install a drainpipe that drains the pond from the bottom to make management and maintenance easier. For example, drawing down the water level for three consecutive winters can reduce as much as 90% of undesirable submerged vegetation. Also, the number and size of harvestable game fish usually increases following drawdowns. In order to protect the nutrient quality of your pond water, it is always better to divert excess water around rather than through your pond. You may also consider adding an emergency drainway in case of heavy rains; do consult your local Natural Resources Conservation Service (NRCS) for information and regulations in your area. Fertility: This is the amount of nutrients in the water available for the growth of microscopic plants called phytoplankton which are the first link in the pond’s food chain. Phytoplankton levels are directly proportional to the number of fish which can be supported by the pond. Fertility may be determined by measuring the depth of visibility. 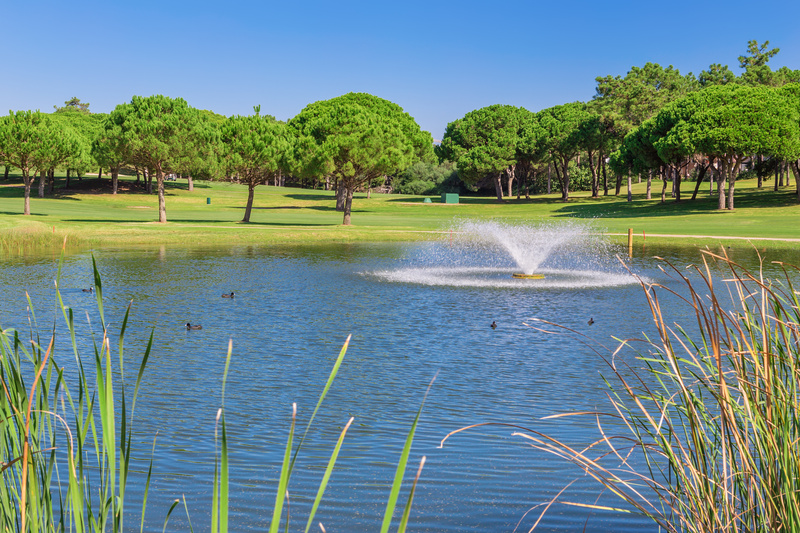 Most recreation ponds should be maintained at moderate to high fertility. This can be accomplished with an initial fertilization and continuous input of fish feed. pH: This is the level of acidity of the water. Most fish prefer a pH of 7 (neutral). While ponds fluctuate on a daily basis, they should be maintained at levels of 6.5 to 9. In areas where the soil is acidic (such as the southern U.S.) or in areas where the soil has little buffering capacity (such as northeastern U.S.), lime may be added to reduce pond water acidity. Alkalinity: This is the measure of the buffering capacity of the water and should be at least 30 parts per million (ppm) for proper phytoplankton growth. Some ponds are naturally well-buffered; others may need periodic liming. Consult your local NRCS, Department of Natural Resources (DNR) or a professional pond management company for advice on this matter. Dissolved Oxygen (D.O. ): This is naturally supplied by aquatic plants and phytoplankton, the wind, and wave action at the surface of the pond. This is the oxygen that fish need to survive. An adequate level of D.O. for most fish is 4 ppm; salmon and trout, however, require more than 6 ppm. Keep in mind that some plants that produce oxygen in the sunlight consume it in the dark. So ponds with very high levels of phytoplankton (water that looks like pea soup) are subject to critically low D.O. levels at night and on cloudy days. This can lead to fish kills. Mechanical agitation of the pond water with, for example, paddlewheels or fountains may be used to aerate the water. Temperature: The temperature determines which species of fish will thrive in your pond. Cold-water ponds (remaining under 70° F) are preferred by trout. Bass, bluegill, and catfish prefer warm-water ponds (warming to more than 75° F). Cool-water ponds (in the 65° F – 75° F range) may, depending on the size of the pond, support smallmouth bass or walleye. Some ponds in this temperature range may also support cold and warm water fish. Consult your local extension agency or a professional pond management company for information on species that perform best in your area. This entry was posted on Wednesday, September 14th, 2016 at 8:48 am	and is filed under News & Updates, Pond, lake, fish. You can follow any responses to this entry through the RSS 2.0 feed. Both comments and pings are currently closed.